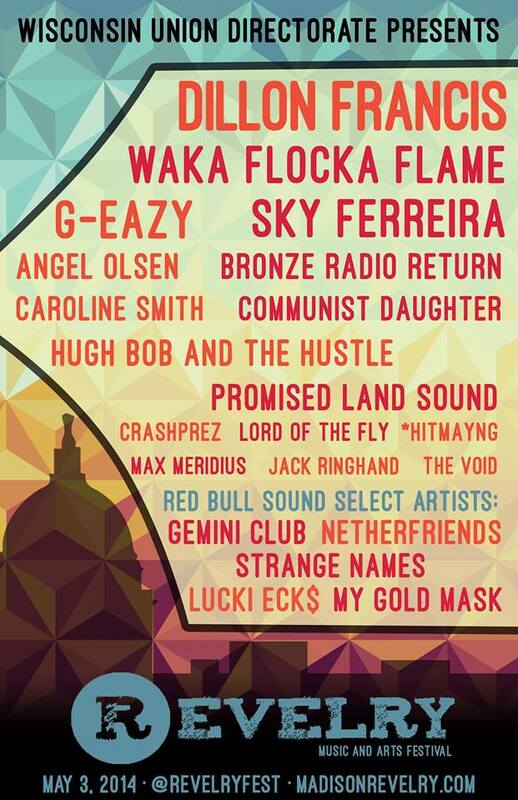 This Saturday: Revelry Music and Arts Festival! With Coachella out of the way, festival season is officially now in full bloom. 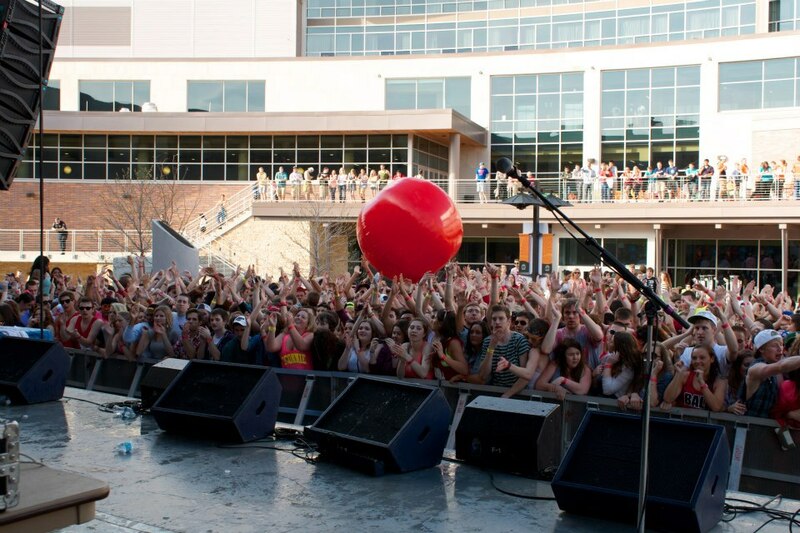 So, why not kick off your summer with UW Madison’s own premiere music and arts festival–Revelry! **Who says the party stops at 10? It’s Saturday night people! 4. You’re broke or your friends are too cheap? Student tickets are $5. You paid $250 for Lollapalooza. Do I need to haggle you more?! 5. If you really need a better reason, then think about how epic it is spending the entire day parting with your fellow badgers?! Food, Music, Drinks, and Art?! *5.5 And for those of you worried about the chance of rain on Saturday, all I have to say is: 1. It’s April.. 2. Put on your wellies and rain slickers and pretend like you’re at Britain’s coolest festival, Glastonbury (where it rains like every freaking year). We’ll see you kids this Saturday at Revelry! Get ready to “revel on their level.” More info can be found on Facebook, Twitter, and their site. You know a weekend is going to be great when you’re already anticipating for the week to be over on Monday at one in the morning. Whether you’ll be attending the annual Mifflin Street Block Party, hitting up capitol square for the weekly fresh market, or kicking back and watching a Star Wars trilogy (preferably the original one), there is no shortage of funtivities available for Madison citizens this first weekend of May. And while all of these funtivities are respectable means of entertainment in their own right, I want to highlight the weekend event I will be attending: Revelry Music and Arts Festival. DISCLAIMER: I am in no way being prompted to write this feature by any member of WUD Music. I chose to write this feature because it’s music related, it’s Madison news, I love music, live concerts are awesome, and I want to give those that are or may be going a small preview of what they can expect out of the musical talent at the festival. So let’s get to that. I am going to give my short, unarticulated opinion of the artists that were highlighted in the wonderfully crafted video below. Here goes nothing. 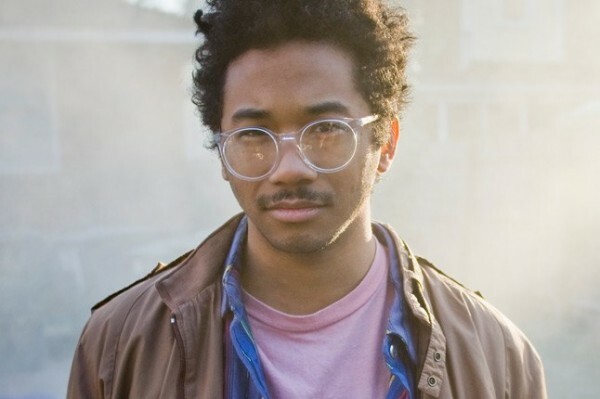 Toro y Moi – Contrary to what your initial reaction may be, Toro y Moi is actually one man. And he may be one of the chillest men I’ve ever heard on a track. For starters, he combined both the Spanish and French languages to create his stage name. It doesn’t matter as long as it translates to English easily (Bull and Me) and sounds cool, right? Beyond this, his calm vocals and looped electronic beats are combined to him consider him a part of the genre known as chillwave. It doesn’t get any more chill than that. Hoodie Allen – One of my close friends has been a Hoodie fan well before the Revelry lineup was released, and since its release I have hopped on the bandwagon hard. His All American EP was only $5 on iTunes, and provides eight solid tracks that exemplify his catchy music and smart lyrics. In addition, his newest mixtape Crew Cuts is on his website for free! Outside of his music, the former Google employee and UPenn Sprint Football player has collaborated on comedy videos with CollegeHumor that are just too funny to only watch once. Phox – This seven-piece band from Baraboo, Wisconsin utilizes instruments that run the gamut of sounds, resulting in songs that are most often whimsical, but can also be hectic and heavy. No songs particularly called out to me, but there’s no doubt that the band is unique. The Mowgli’s – While the only music I could find of theirs was the five songs from their Love’s Not Dead EP, this pop-rock octet has an established pedigree with a recent performance at SXSW 2013 and a scheduled performance at Lollapalooza 2013. Their eight-person chorus is extremely catchy, and “San Francisco” is an irresistible summer jam. Chance the Rapper – Chance the Rapper is definitely a different sounding hip-hop artist, with a significantly higher voice than your typical MC. His second mixtape, Acid Rap drops tomorrow, so hopefully Madison will be receptive to his new material come Saturday. Delta Spirit – This band has a strong alternative rock sound, and many of the songs I listened to have the feel of a live show even though they’re master tracks. I trust that their live performance will be nothing short of a great display of musical talent. In addition, they have a song on the official first volume of The Walking Dead soundtrack, so I am sold. Julian Lynch – Chill, instrumental, and articulate all at once, Julian Lynch’s music gives off good vibes. With a Ph.D. in ethnomusicology (!?) from UW-Madison, I think concert attendees will give the former city resident a warm reception. Oh Land – Hailing from Copenhagen, Denmark, Nanna Øland Fabricius serves as singer, songwriter, and producer, for her music. Pianos and an extensive palette of electronic sounds make for a plethora of experimental tunes for Oh Land to sing over. It will be interesting to see how her music translates to a live performance. 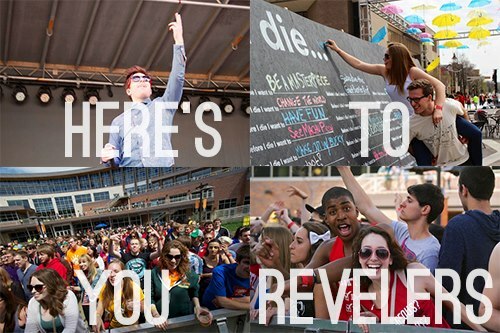 So there you have it: A preview of the biggest acts that Revelry has to offer. It would seem that there is a little something for everyone in the festival’s first installment, and I couldn’t be more excited. Here’s to the joys of live music, summer, and the continued success of this festival for years to come. Revel on. Lost Lander and Paper Thick Walls Tonight! Yes, it’s a tad blizzardly out today, and that’s good news because what sounds better than sitting in the Rath with friends drinking beer and listening to some great music? Exactly, nothing. Tonight we’re lucky to have two great bands serenading us, Lost Lander and Paper Thick Walls. Portland, Oregon’s Lost Lander has been getting considerable love from all over the music scene including the blogosphere and some favorite music sources including Spin and Rolling Stone. Just to solidify those sentiments, they were just recently named Best Emerging Act of 2011 in the Best of Portland series. Last month their debut LP, DRRT, premiered and it echoes beautiful yet sometimes mysterious places and emotions; together it’s resonant of a symphonic brilliance that proves what good music can do not only for your ears but for your soul as well. Frontman Matt Sheehy, part lyricist and part forester, was inspired by the Pacific Northwest with sounds that some have been compared to Band of Horses and Fleet Foxes. Also having pride in his Alaskan roots it’s no surprise Lost Lander has an earthy, experimental feel to them (the physical cd actually folds into a mini planetarium, KOOL). One of the standout tracks, ‘Afraid of Summer’, is graceful and unrestrained. Sheehy speaking with Rolling Stone described it as having a “spooky, mesmerizing” force that had him in a trance while working on it. Also performing tonight is Chicago’s Paper Thick Walls who are sure to start the night on a good note with their unique mix of guitars, fiddle, mandolin, and bass. Their debut album ‘A Thousand Novels’ came out last year and has already been well received with orchestral melodies and compelling stories. Tune in to 91.7fm WSUM online or over the air at 4pm today to hear Lost Lander perform live in studio and make sure to check out the show tonight, 9:30 at the Rath in Memorial Union. As always the union page has additional info!